The seventh batch of appointments for Windsor is Forever, a collaborative project with Jason Sturgill, have been finished. 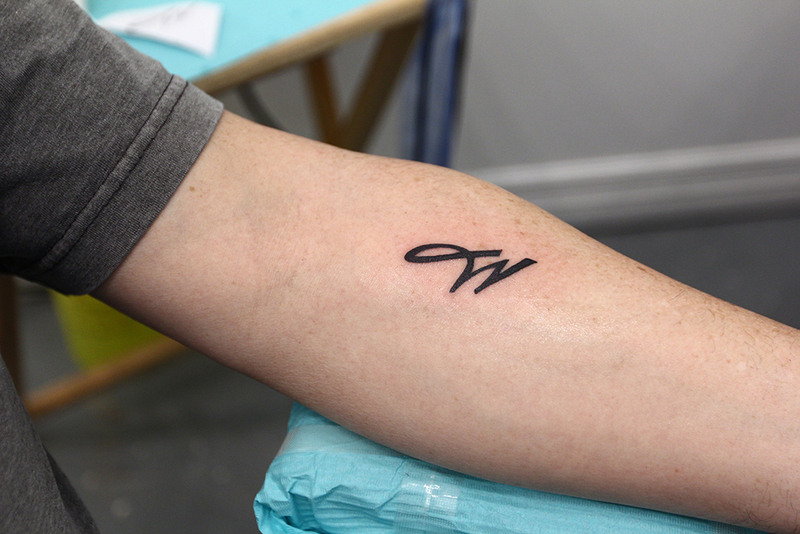 Here are the results: three Windsor tattoos by Dave Kant, Steve Jones, and Jon Jimenez. 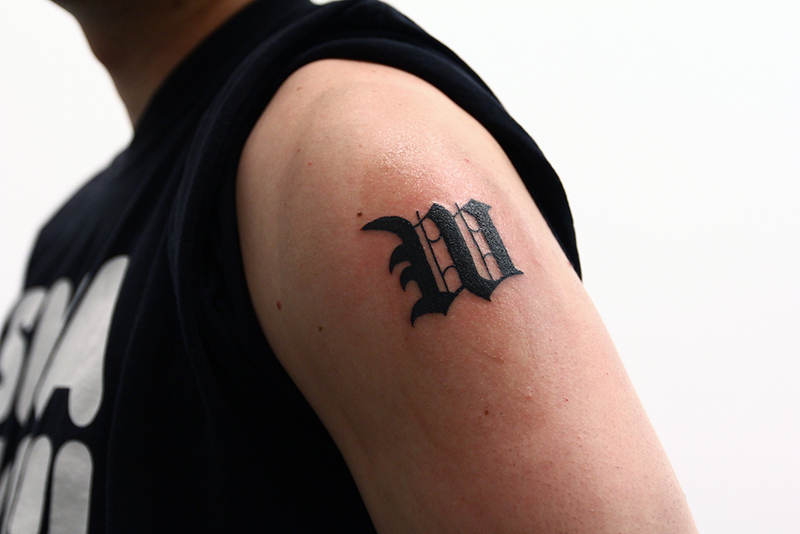 Dave Kant is on a roll with tattooing the crisp, black “W”. This guy had it done on the deltoid. 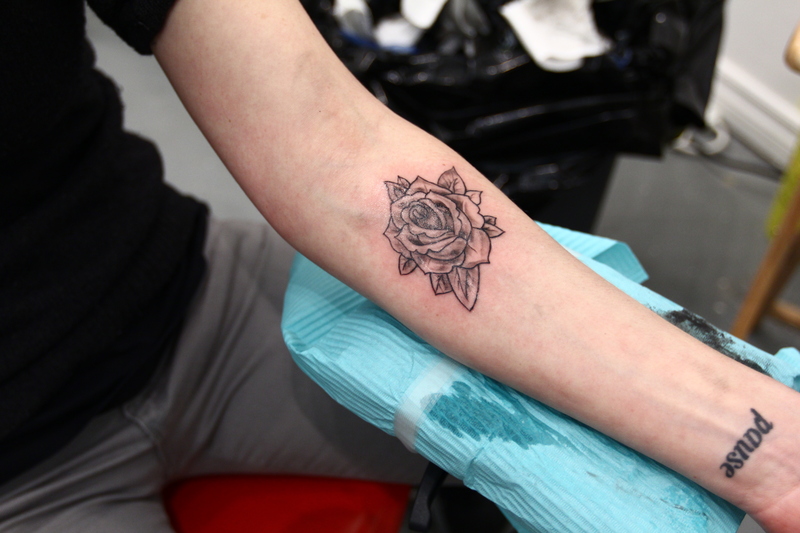 Another recurring design choice, the Windsor rose / Bridge design is being tattooed on a forearm. Jon Jimenez pulls off another well-toned Windsor rose. 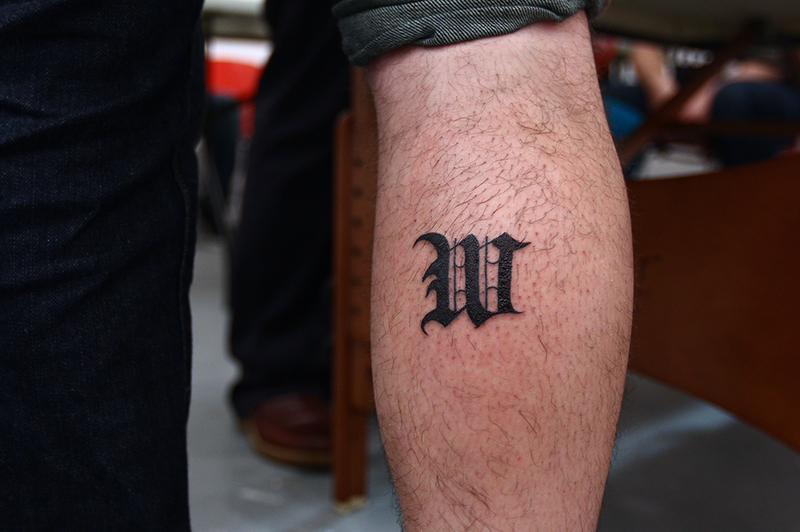 This Windsor “W” is being done on a participant’s calf. Here it is, a completed Windsor “W”, nice and bold. Tattoo by Dave Kant. The sixth batch of appointments for Windsor is Forever, a collaborative project with Jason Sturgill, have been finished. 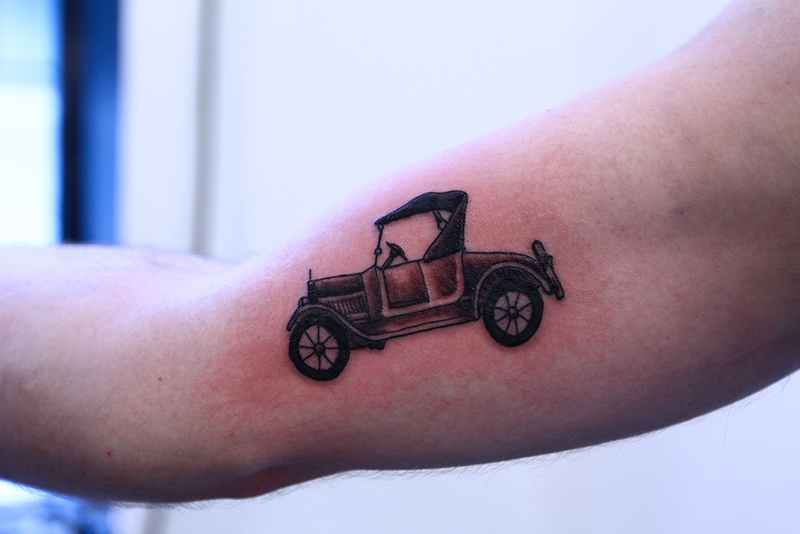 Here are the results: three Windsor tattoos by Dave Kant, Steve Jones, and Jon Jimenez. Zeke shows off his two inner-elbow tattoos. Tattoos by Steve Jones. 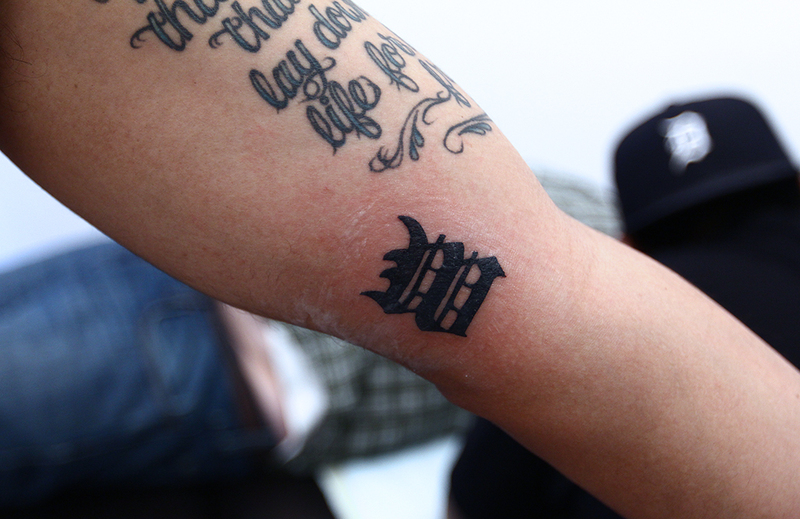 This participant got a Windsor / Detroit “W” on a very sensitive area near the inner elbow. Here is another fine iteration of the “W” by Steve Jones. 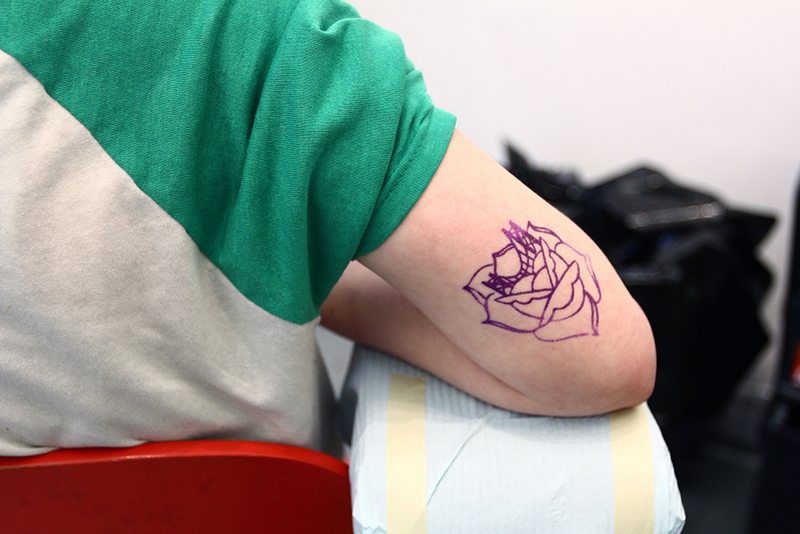 Here is another crisp rose design underway. 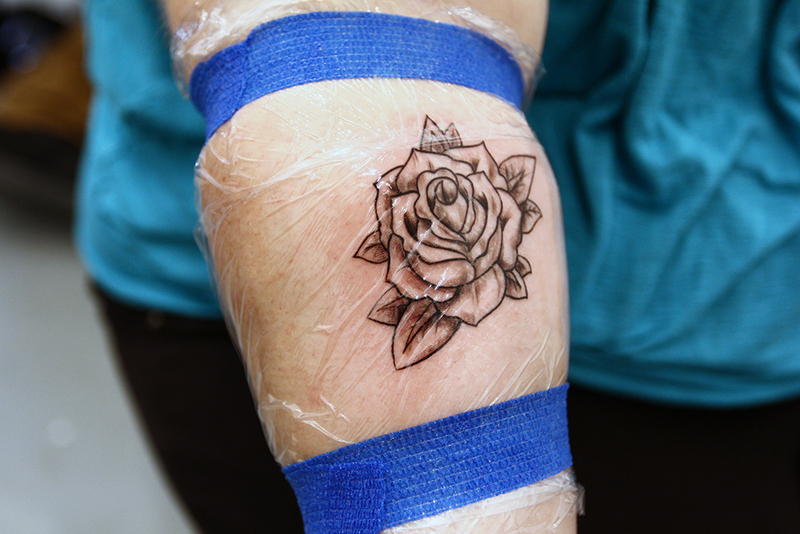 This finished Windsor rose has been intensified with tonal work. Tattoo by Steve Jones. The fifth batch of appointments for Windsor is Forever, a collaborative project with Jason Sturgill, have been finished. 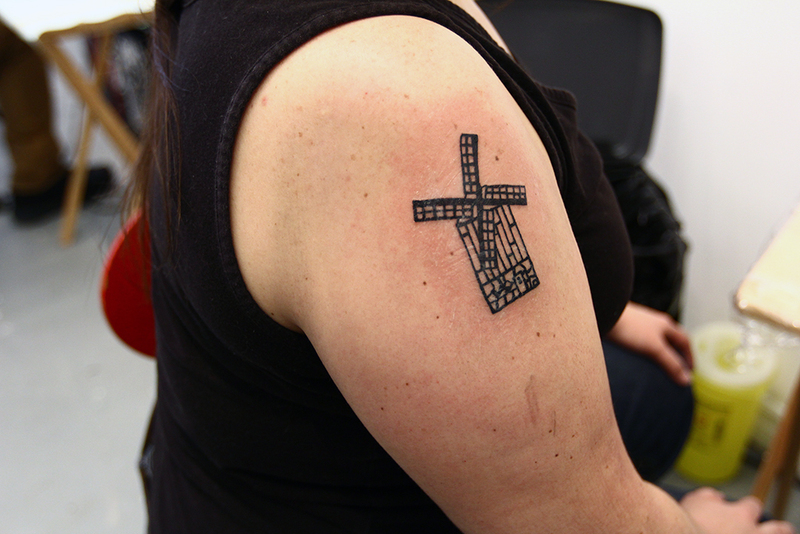 Here are the results: three Windsor tattoos by Dave Kant, Steve Jones, and Jon Jimenez. Somebody finally got the Ford Model A design that Hiba designed. Tattoo by Dave Kant. This participant submitted a “W” pulled from a classic car named the Chrylser “Windsor”. The tattoo didn’t take long, but it looks fantastic. Tattoo by Steve Jones. 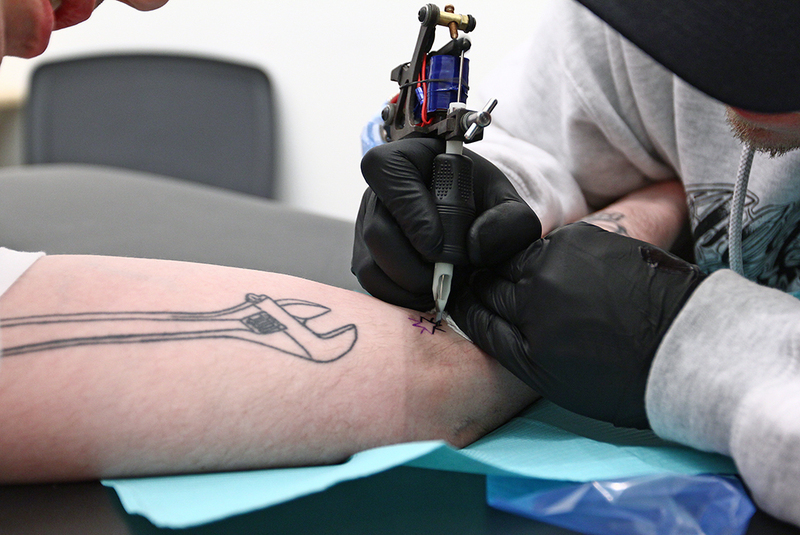 Here’s another inner arm tattoo…it’s a popular spot today! This guy is getting a Windsor seal. Here is the finished Windsor seal. This time Jon Jimenez took it on. The fourth batch of appointments for Windsor is Forever, a collaborative project with Jason Sturgill, have been finished. 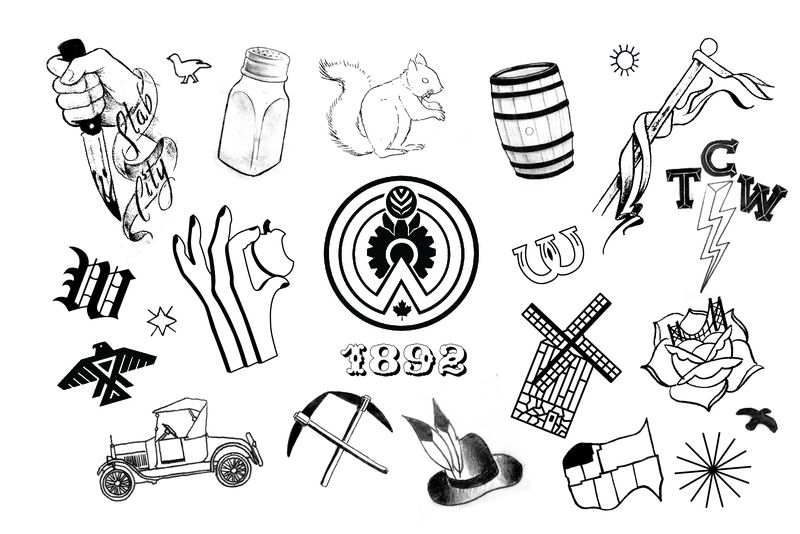 Here are the results: three Windsor tattoos by Dave Kant, Steve Jones, and Jon Jimenez. The man himself, Jason Sturgill, got a nice ambiguous Colbert-inspired design tattooed by Jon Jimenez. 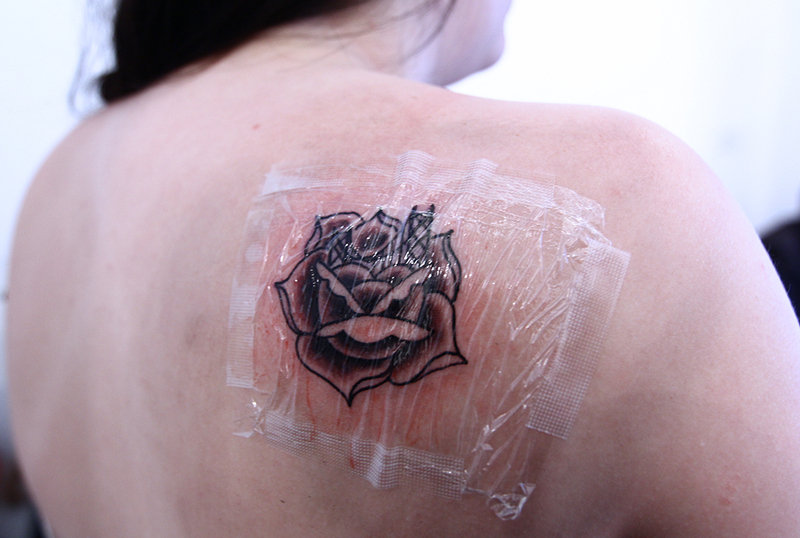 One participant got the Windsor rose / bridge design on the back of her shoulder. 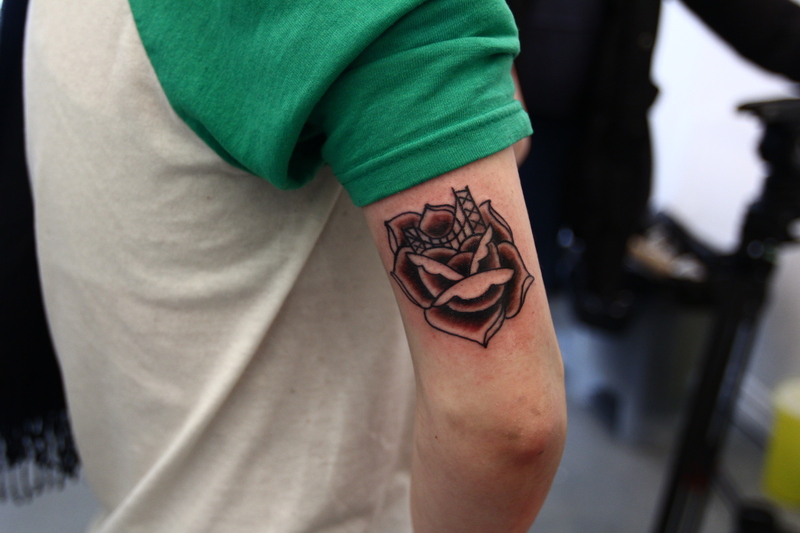 Jon Jimenez added some detail to his Windsor rose / Ambassador Bridge design. One participant got a simplified version of the Windsor seal. Here is the finished Windsor seal with the outer ring removed (tattooed by Dave Kant). The third batch of appointments for Windsor is Forever, a collaborative project with Jason Sturgill, have been finished. 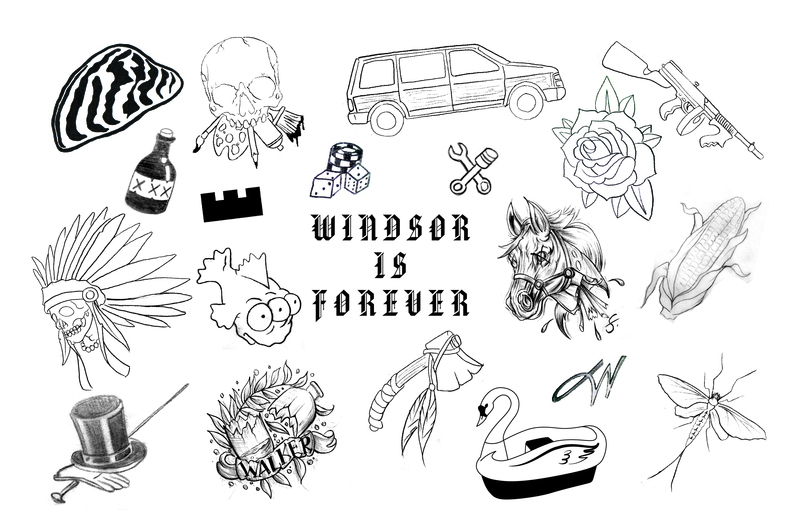 Here are the results: three Windsor tattoos by Dave Kant, Steve Jones, and Jon Jimenez. 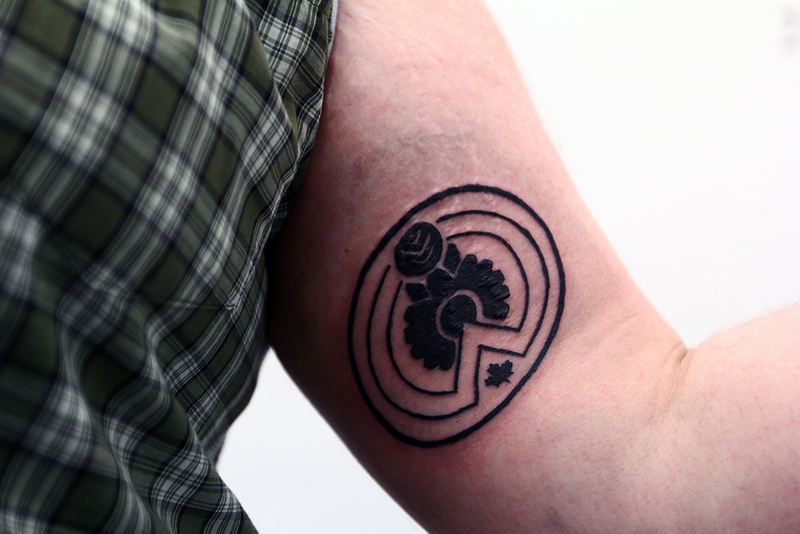 Here is another version of the Windsor seal Dan Bombardier found (tattooed by Dave Kant). 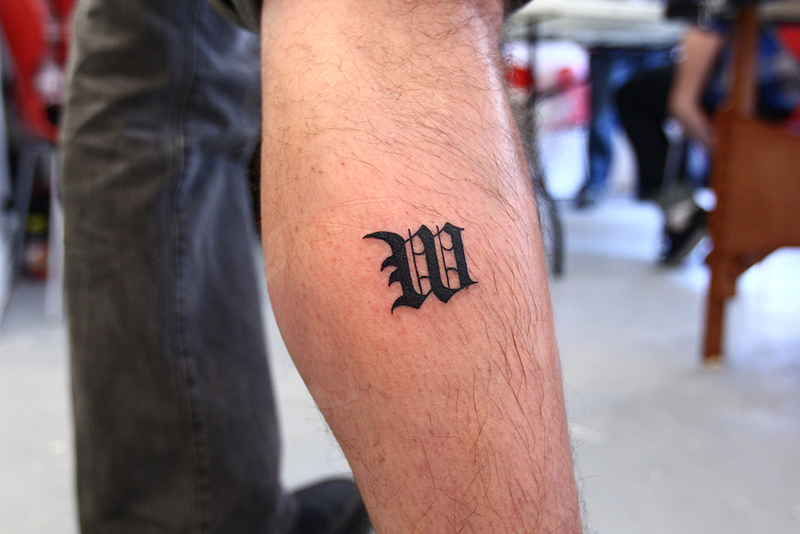 Here is Dave Kant tattooing a Windsor “W” on a participant’s lower leg. …and the finished product by Dave Kant. Check out that amazing line work. This is the look of pure joy, the moment you realize that you have an awesome salt shaker tattoo on your arm. Here is the finished work by Steve Jones. 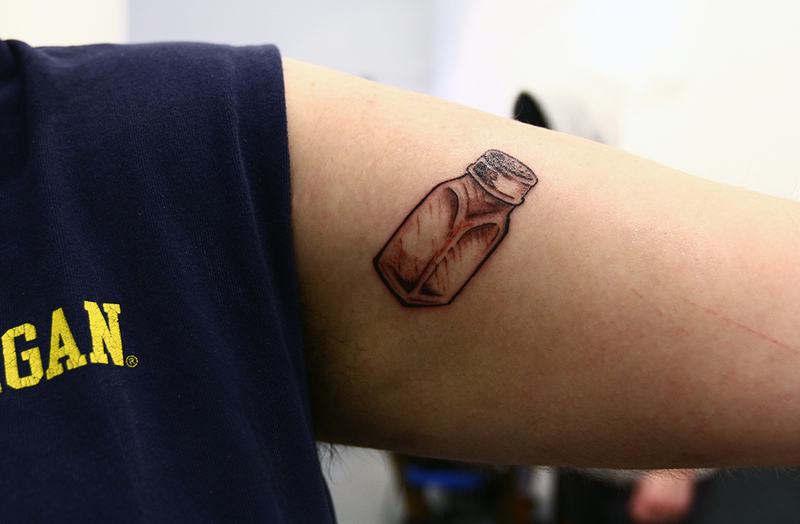 He added a bit of extra shading to the sides of the shaker. Awesome. The second three appointments for Windsor is Forever, a collaborative project with Jason Sturgill, have been finished. 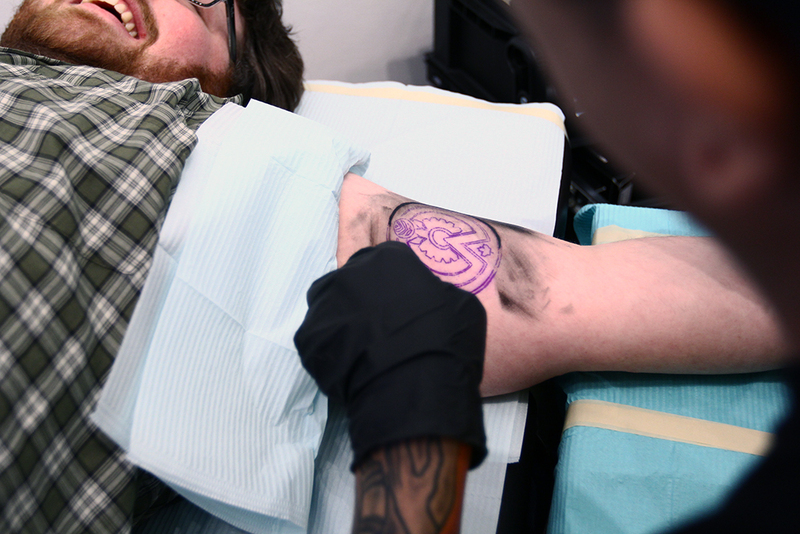 Here are the results: three Windsor tattoos by Dave Kant, Steve Jones, and Jon Jimenez. 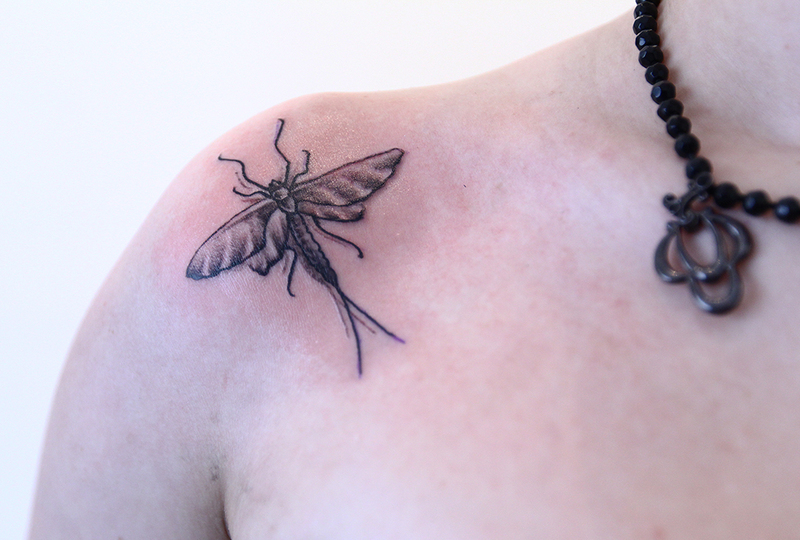 Here is a detailed mayfly design done on the shoulder by Dave Kant. 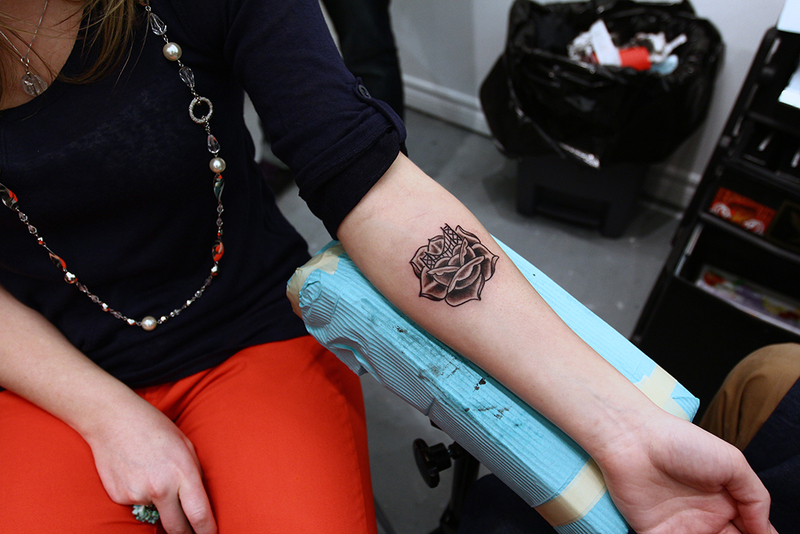 Here is a design Jon Jimenez did of a rose with the Ambassador Bridge nestled inside. Here it is, in ink! 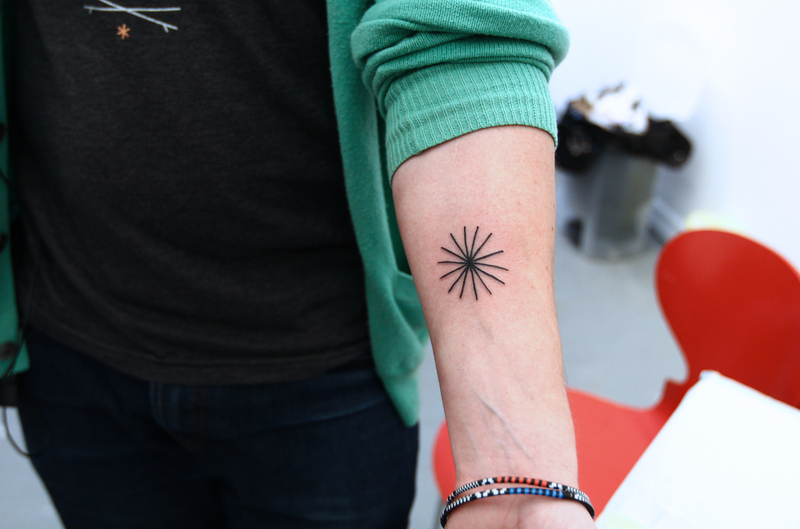 Jon Jimenez ended up tattooing his own design and adding a few extra details. 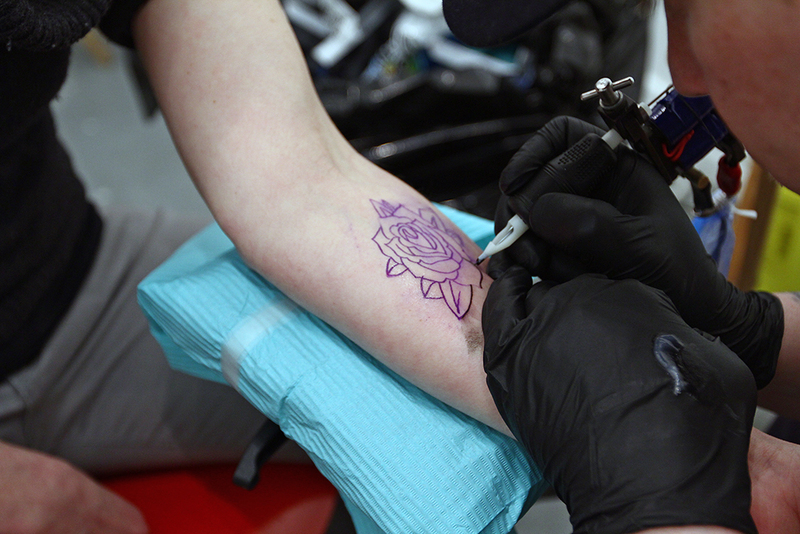 Here, Steve tattoos a rose on the forearm of one participant. Steve Jones’ added some depth to the original design on the fly. The first three appointments for Windsor is Forever, a collaborative project with Jason Sturgill, have been finished. 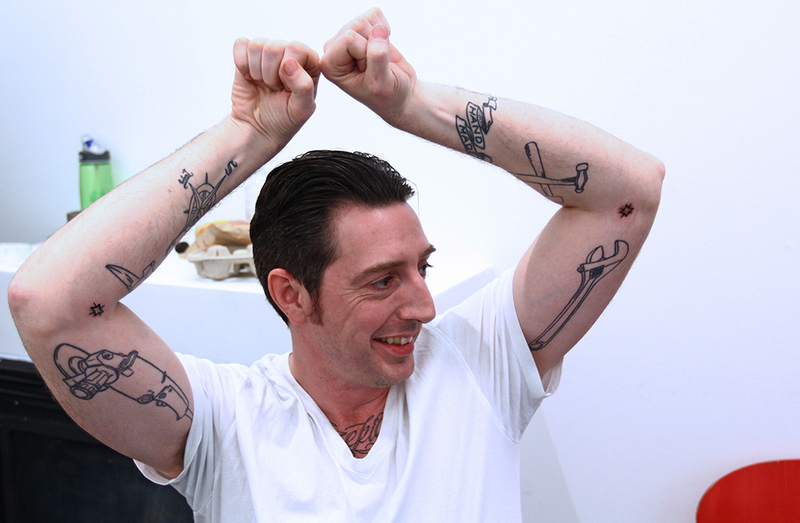 Here are the results: three fine tattoos by Dave Kant, Steve Jones, and Jon Jimenez. 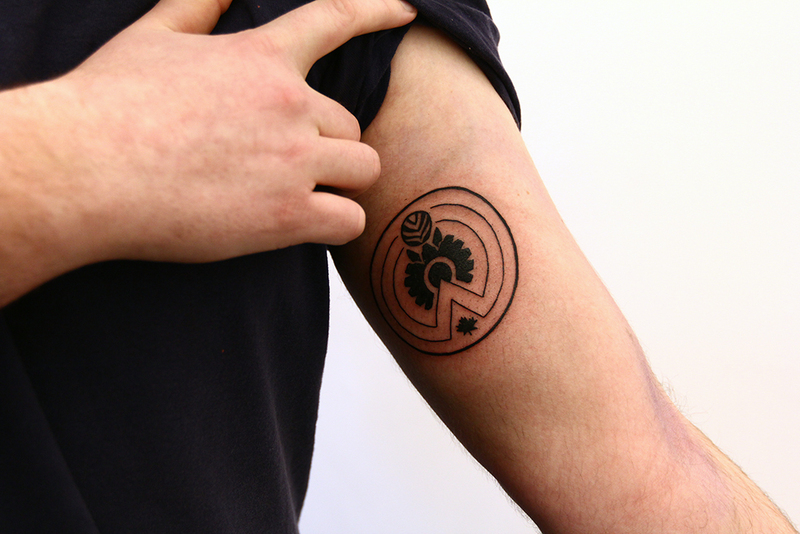 The first appointment was a simplified Windsor seal completed by Dave Kant. 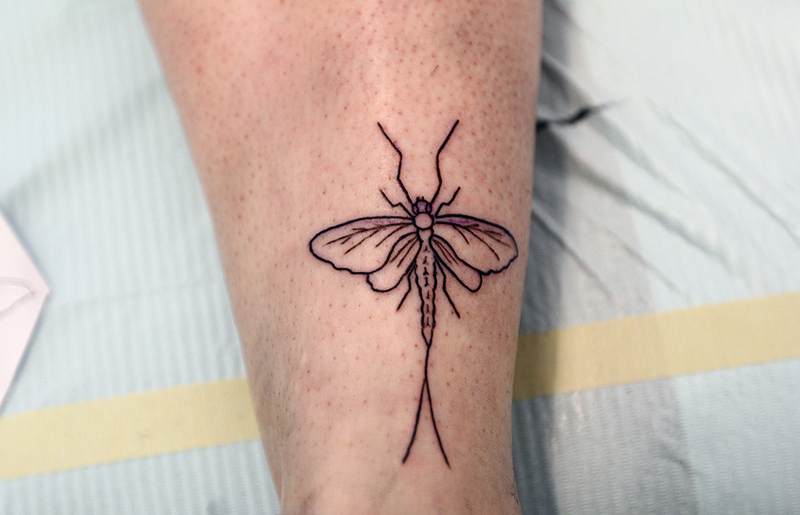 Process shot of the second appointment, a mayfly done on a participant’s ankle. Here is the first iteration of the mayfly tattoo design, done by Jon Jimenez. Process shot of the Sandwich Town Windmill Design. Here is the completed Sandwich Town design done by Steve Jones. Please stay tuned for more updates from the day. Windsor is Forever Tattoo Day Begins! 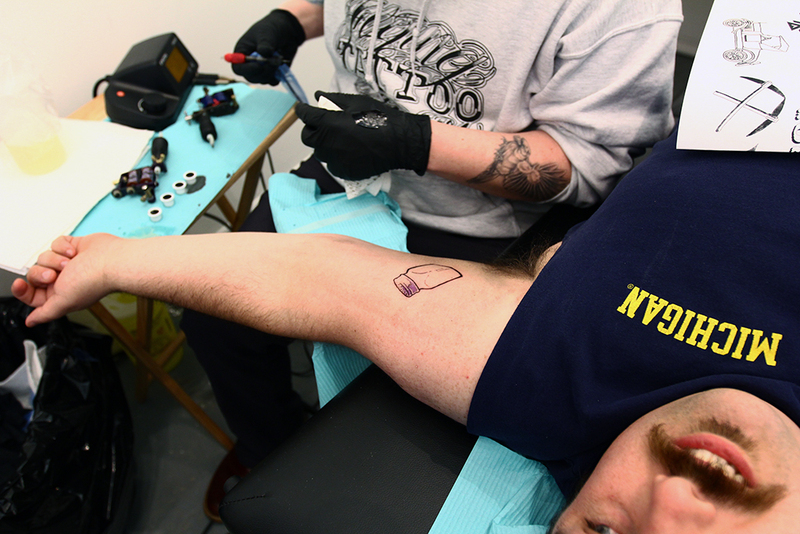 The first tattoo of the day as part of Windsor is Forever is in progress! 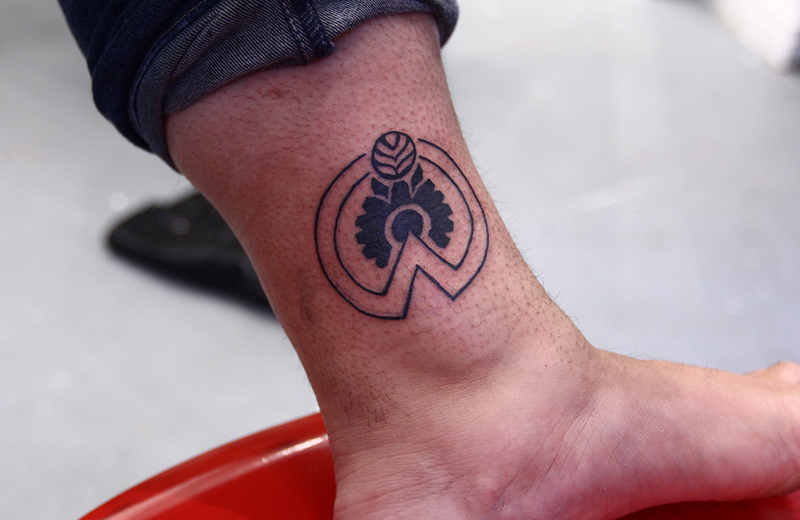 This fellow chose a Windsor crest design provided to us by Dan Bombardier. 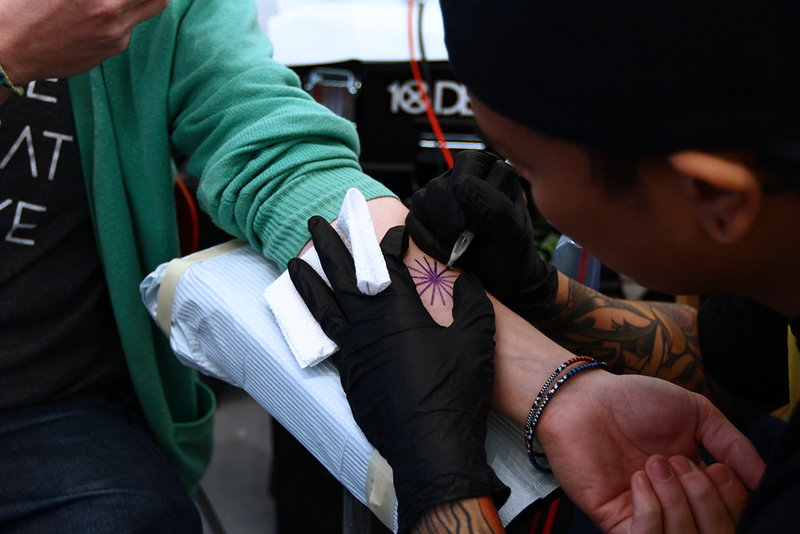 The tattoo artists pre-printed a batch of each design. This is one of the largest designs in the set.